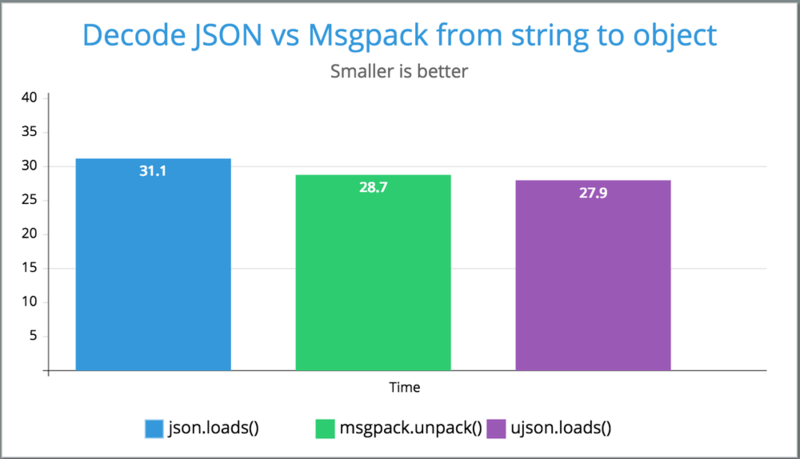 tl;dr; I see no reason worth switching to Msgpack instead of good old JSON. In this experiment I take a massive JSON file that is used in a single-page-app I worked on. If I download the file locally as a .json file, the file is 2.1MB. But! How well does it compress? Oh my! When you gzip the files the .json file ultimately becomes smaller. By a whopping 0.5%! Result (using Python 3.6.1): All about the same. One of the benefits of Msgpack is that it can used for streaming. "Streaming unpacking" as they call it. But, to be honest, I've never used it. That can useful when you have structured data trickling in and you don't want to wait for it all before using the data. Another cool feature Msgpack has is ability to encode custom types. E.g. datetime.datetime. Like bson can do. With JSON you have to, for datetime objects do string conversions back and forth and the formats are never perfectly predictable so you kinda have to control both ends. 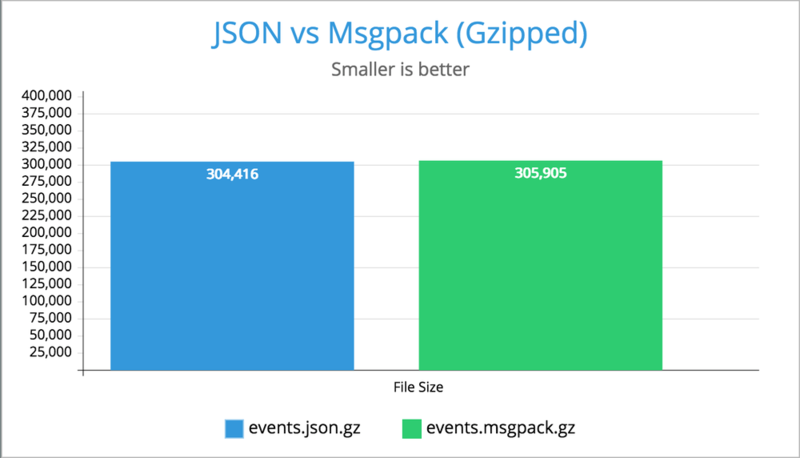 But beyond some feature differences, it seems that JSON compressed just as well as Msgpack when Gzipped. And unlike Msgpack JSON is not binary so it's easy to poke around with any tool. And decompressing JSON is just as fast. Almost. But if you need to squeeze out a couple of extra free milliseconds from your JSON files you can use ujson. Conclusion; JSON is fine. 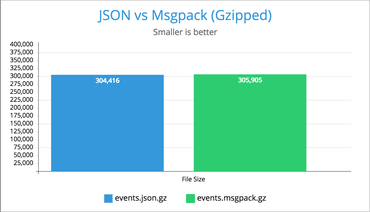 It's bigger but if you're going to Gzip anyway, it's just as small as Msgpack. Another binary encoding format that supports custom types is BSON. This one is a pure Python implementation. BSON is used by MongoDB but this bson module is not what PyMongo uses. So it's 7% larger than JSON uncompressed. Meaning it's 12% fatter than JSON when Gzipped. In other words, bson is about 600% slower than json. This blog post was supposed to be about how well the individual formats size up against each other on disk but it certainly would be interesting to do a speed benchmark comparing Msgpack and JSON (and maybe BSON) where you have a bunch of datetimes or decimal.Decimal objects and see if the difference is favoring the binary formats. What's wrong with XML? Actually definable data types and such. You can define types in JSON too if really want to. XML and JSON is just one big string after all. It's all down to you how to de-serialize it. JSON has some built in "standards", if you can call it that. With XML you have define that yourself, in some specific way to your specific tools. With JSON, an integer makes sense between a Python and Ruby program. Also, XML is extremely verbose. I think BSON itself is fast, it was designed to be accessed directly, by copying it into dict you kinda misuse BSON. If for some reason you want to use standard dict to access data, then BSON is not a format to consider. It is interesting topic to me. I want to store neural network layers and right now deciding, should I support msgpack or not. 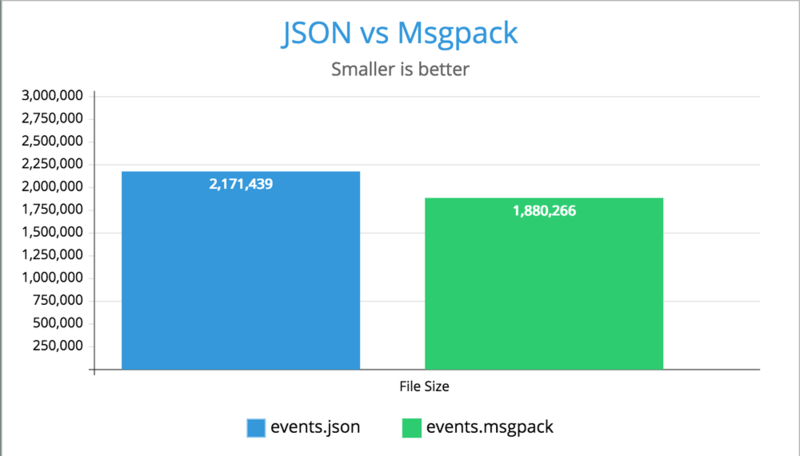 If your events.json is mostly strings, than no wonder json ≈ msgpack. 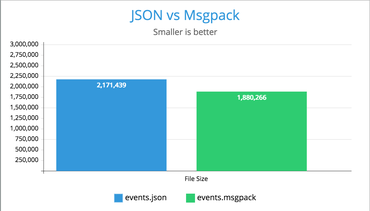 It's interesting how json and msgpack compares when the data is mostly arrays of floats. There are plenty of non-strings in that events.json but, yes, it's generally mostly strings. Does it have a good Python module? pretty good yes. It's as fast as ujson, for the same size. I find msgpack really shines when you design your datasets and protocols around heavy use of arrays and integers. If your data is string heavy, there is little reason to use it. Also the elephant in the room, what about large binary values? It's annoying to encode Dates in JSON, but it's really annoying to have to encode large binary values as giant base64 strings. Have you tried the official bson module that's included in PyMongo? PyMongo's bson is implemented in C, it's surely much faster than the pure-Python module you tried. No, because I couldn't find it outside pymongo. When it comes to embedding images/files you get same size than gzipped json without base64 encoding, and ~30% less size than JSON uncompressed. Yes messagepack is ideal for those use cases using pure bytes which is not supported in JSON.